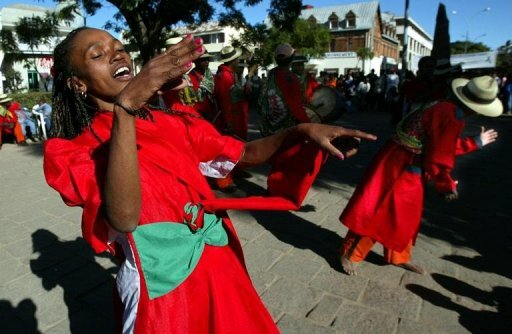 A Malagasy traditional singing and dancing group is seen performing in the streets of Antananarivo, in 2002. Several dozen Indonesian women founded the colonisation of Madagascar 1,200 years ago, scientists said on Wednesday in a probe into one of the strangest episodes in the human odyssey. Anthropologists are fascinated by Madagascar, for the island remained aloof from mankind's conquest of the planet for thousands of years. It then became settled by mainland Africans but also by Indonesians, whose home is 8,000 kilometres (5,000 miles) away. A team led by molecular biologist Murray Cox of New Zealand's Massey University delved into DNA for clues to explain the migration riddle. They looked for markers handed down in chromosomes through the maternal line, in DNA samples offered by 266 people from three ethnic Malagasy groups. Twenty-two percent of the samples had a local variant of the "Polynesian motif," a tiny genetic characteristic that is found among Polynesians, but rarely so in western Indonesia. In one Malagasy ethnic group, one in two of the samples had this marker. If the samples are right, about 30 Indonesian women founded the Malagasy population "with a much smaller, but just as important, biological contribution from Africa," it says. The study focussed only on mitrochondrial DNA, which is transmitted only through the mother, so it does not exclude the possibility that Indonesian men also arrived with the first women. Computer simulations suggest the settlement began around 830 AD, around the time when Indonesian trading networks expanded under the Srivijaya Empire of Sumatra. The investigation points to other contributions from Southeast Asia. Linguistically, Madascagar's inhabitants speak dialects of a language that traces its origins to Indonesia. Most of the lexicon comes from Ma'anyan, a language spoken along the Barito River valley of southeastern Borneo -- a remote, inland region -- with a smattering of words from Javanese, Malay or Sanskrit. Other evidence of early Indonesian settlement comes in the discovery of outrigger boats, iron tools, musical instruments such as the xylophone and a "tropical food kit," the cultivation of rice, bananas, yams and taro brought in from across the ocean. "Madagascar was settled approximately 1,200 years ago, primarily by a small cohort of Indonesian women, and this Indonesian contribution -- of language, culture and genes -- continues to dominate the nation of Madagascar even today," says the paper. How the 30 women got across the Indian Ocean to Madagascar is a big question. One theory is that they came in trading ships, although no evidence has ever been found that women boarded long-distance merchant vessels in Indonesia. Another idea is that Madagascar was settled as a formal trading colony, or perhaps as an ad-hoc centre for refugees who had lost land and power during the expansion of the Srivijayan Empire. Yet a third -- and more intrepid -- hypothesis is that the women were on a boat that made an accidental transoceanic voyage. That notion is supported by seafaring simulations using ocean currents and monsoon weather patterns, says Cox's team. Indeed, in World War II, wreckage from ships bombed near Sumatra and Java later washed up in Madagascar as well as, in one case, a survivor in a lifeboat. The study appears in the British journal Proceedings of the Royal Society B.